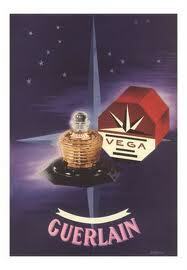 Guerlain Vega Perfume – where did they get that name? If my Google translated this properly… “VEGA – the star of fire more brilliant than the skillful sun the body of one will have invisible and hot. That’s the official description, I believe. Well, I have searched high and low to get the notes for Guerlain Vega because I am NOT gifted with the nose some of y’all have… yet… or ever. I just know what I like and sometimes I can pick out a note here and there. Guerlain Vega was originally created by Jacques Guerlain in 1936. the 2005 version of Guerlain Vega is part of one re-release each year of an old fragrance. Exclusive, of course, to the Champs Elysees boutique. This goes on big and florally and a little powdery. There’s definitely a big note of ylang-ylang on the top, I know there’s iris in there (duh, powdery). Jasmine? Pretty sure some sandalwood in the base. That’s probably as good as it’s going to get in the notes. There’s another one in there, but it isn’t coming to me what it is, just a little tangy. As Luca said, Guerlain Vega does go on as a big floral with woody notes. Not overly sweet in any way or even overly floral. The drydown is really lovely. It definitely has that “older perfume” feel to it, but I don’t mean that in a bad way. It just feels like it’s from another time and place. A lot less powdery Shalimar (which doesn’t work on me). A woody Jasmine with something a little zesty is probably the closest I’m going to get. Really lovely. I’m interested to know what all is in it since even my little Guerlain pamphlet won’t tell me in French or English. How odd. M, I’m sticking a sample of this in your package, since I know you love bdi and have a better nose, you should be able to tell me if I’m crazy or not. Update: I spritzed on Bois des Iles to run a comparison. They’re not twins or even necessarily brother and sister, but they are at least cousins. Wow! Vega sounds really nice! Did you go to Paris to get these? If it is a cousin to Bois des Iles, I need some, LOL! Thanks for the review, I have heard almost nothing about Vega. Christina — no. I made an order for the Attrape Coeur, and they threw in some really generous samples, and Vega was one of them. I’m anxious to try the other three I have as well. You should try Chanel 22. Glad you stopped by! I’ve enjoyed your blog. I do hope you get to try Vega next time you’re in Paris.